Did You Have A Bad Day? Find Mercy! I blew it today. Oh man did I blow it. I had to stop at Wal-Mart for milk and Diet Pepsi. Seems innocent enough, right? But Lord have mercy, right before the self checkouts, I saw them. Those fluffy, sweet, pretty frosted sugar cookies. You know the ones. They decorate them in brown and orange for Thanksgiving, red and green for Christmas and pink for Valentine’s Day. And no matter which color they are, they look so yummy! And I bought some. Tossed them right in my cart, swiped my debit card, and voila, they belonged to ME! And what did I do when I got home? I started eating them. One, then another, then another, throughout the afternoon, until I lost count of how many I actually stuffed in my face. Sigh… so much for my new near-paleo, vegetable-rich, low-calorie lifestyle. I texted my accountability partner and let her know that I blew it. I expected a lecture. An “oh no you didn’t!” But instead she made plans to go walking with me tomorrow. And we re-set our goals for the rest of the week to eat healthier and consume some of those green veggies that are sitting in my fridge waiting for me to include them in my meals. We re-set our goals for the rest of the week. Why am I telling you all of this? Well, there’s a couple of reasons. As I sit and ponder this blown day, I realize that there are a couple of correlations to my Stained Glass Life. One is that the value of an accountability partner can not be measured! Whether it’s someone from your church, a neighbor, or a friend who lives across the country, you need someone you can go to when you’re struggling in your faith. I’m blessed to have several. Maybe God just knew it would take a lot of accountability to keep me in line, or maybe He just knew I was needy, either way, He blessed me with several amazing women of faith who will talk me out of attending my self-pity parties, throw me a ladder to climb out of my pits of discouragement, and pray me through the bad days. I don’t know how I ended up with them, so I can’t give you a one, two, three list of how to find one yourselves, but ask God and I bet He’ll help you. He’s good at that. Ask God and I bet He’ll help you. He’s good at that. The second correlation is that no matter how badly we screw up, He gives us new mercy every single morning. Every. Single. Morning. 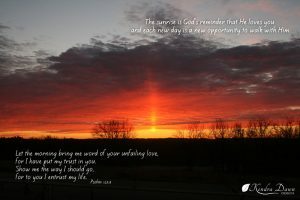 When we are walking with Christ, every night that we lay our heads on our pillows we begin the process of becoming renewed in Him, and we wake up to a morning sun (or a cloudy day) with a fresh start in His eyes. Why? Because He’s just like that. He’s so good and He loves us so much that He just keeps giving us another chance to have a good day. He gives us new mercy. Every. Single. Morning. So no matter how bad your day was, or how many bad days you’ve had this week, remember that tomorrow is a new day and you can start over. His mercy is new and waiting for you. http://kendradawndesigns.com/wp-content/uploads/2016/02/FI_Morning-Grace.jpg 533 800 Kendra http://kendradawndesigns.com/wp-content/uploads/Leaf-White-156px.png Kendra2016-02-08 06:04:092016-11-24 03:42:51Did You Have A Bad Day? Find Mercy! Does Your Faith Get Tired?